Season Greetings from Adhanur Helping Hands! We are all fine in the Home. Children are writing second semester exams and they are preparing well. First of all, I must thank from the bottom of my heart the support you are rendering to accomplish the mission that we started 8 years ago. At present we have 42 children staying in the Orphanage and provide free boarding and lodging for them. 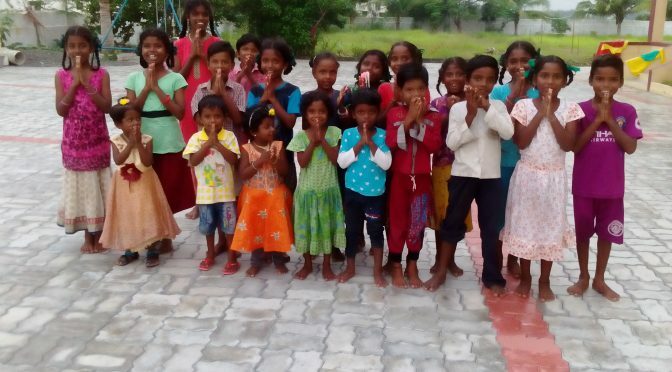 Our 20 Tribal children are getting educational support and food while they stay with their parents. We have six young girls are studying in higher secondary and college. One girl is studying fashion designing course for a year. Through your donations the Orphanage has study hall, recreation hall, dining hall, two dormitories for children to sleep for both boys and girls, playground, washing facilities, rest rooms etc available in the children home. Above all, children are happy in the Orphanage. There are several activities are going on every day such as coaching classes in the morning and evening, children’s counselling, yoga and games, reading library books, computer classes, cultivating vegetables in the garden, tailoring classes for young girls and cooking. In future, we will have more children to support for higher studies. We are planning to start an English medium school in my region so that orphanage will get support for other children’s higher studies. There are poor people who are ready to give their land to start a school but we need money for the construction. With your support we could find donors for our school construction. Shall we accomplish this mission? It’s possible, if we join together for this noble venture to bring education to the doorsteps of poor, orphan, tribals and farmers. Looking forward your support and assistance as we move ahead for a new venture.